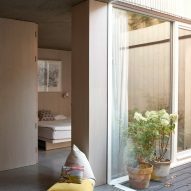 Tikari Works has built a half subterranean home behind a timber screen, on a site that previously contained a garage in south London. 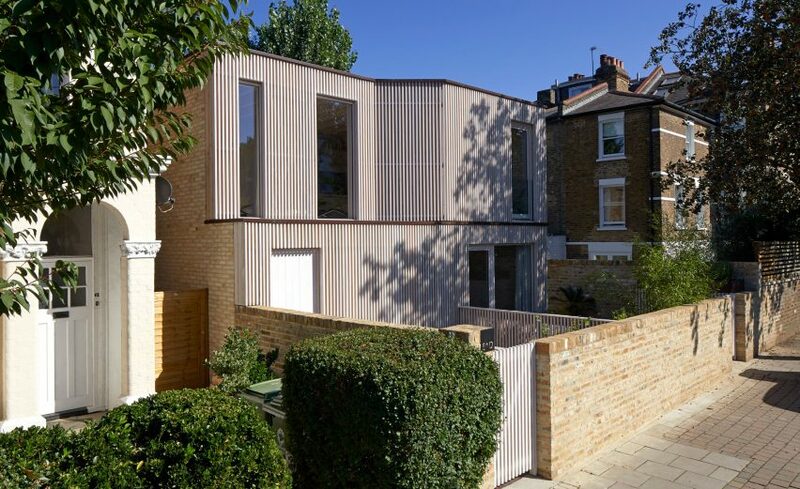 Located in East Dulwich, the two-bedroom house was designed by architects Nicola and Ty Tikari as their own home. 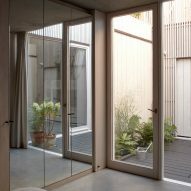 It is also the first completed project by their studio Tikari Works. 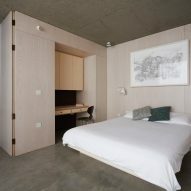 The 80-square-metre plot was previously the site of a domestic car garage and had a buildable area of only 35 square metres, so Pocket House had to be designed to make use of all available space. 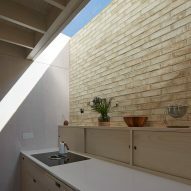 "One of the main challenges of the project was negotiating the physical and planning constraints of the site, whilst making a domestic space which feels generous and soulful; a space which offers a retreat from the outside world and inspires its inhabitants at the same time," said Nicola Tikari. 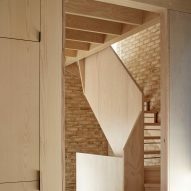 Over half of the house is located underground, with the entire site excavated to create space for two underground bedrooms, a bathroom and a large lightwell in the corner of the plan, which lets daylight into the basement floor. Above ground, the house is stepped back from the street and set back behind the lightwell, to align with the other houses on the street. 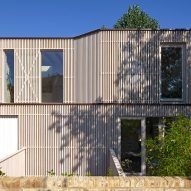 The facade of the house is covered with a slatted timber screen, designed to give privacy to the internal rooms while diffusing sunlight. "The conflicting parameters of daylight versus privacy became an opportunity for a theatrical timber screen," continued Tikari. "This screen helps to mitigate these differing requirements and to keep the western sun at bay. 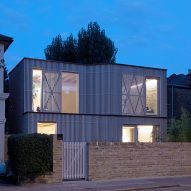 It borrows its language from wooden garages and garden sheds helping to contextualise the building and harmonise the facade into a sculptural 'whole'." The house's living spaces are on the two above-ground storeys, with the kitchen and a second toilet on the ground floor and a living room on the floor above. Along with the large floor-to-height window, the kitchen is lit with a skylight above the counter. 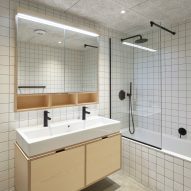 Throughout the house, exposed Danish Petersen Tegl bricks and shot-blasted concrete are combined with fixtures made with light Douglas fir and spruce. "A simple pallete of materials provides a rich backdrop for light to play on, whilst helping to reduce visual clutter in the room and create a sense of space," said Tikari. 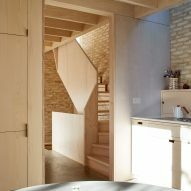 To make the house appear larger, doors are recessed into walls to create a sense of openness, while storage spaces, desks and shelves are built into the house's walls. "To enhance the sense of space, perspectives are carefully curated as you move through the house, focusing views into other rooms or outside to planted areas," Tikari continued. "Oversized doors and folding walls further play with your expectations and sense of space, offering a more generous experience." On a street nearby, Craftworks recently renovated a derelict chapel to create a home with a modern gothic vaulted ceiling. The house was the winner of the 2019 Don't Move, Improve award.